On a whim, I decided to enter a guitar design contest I happened to see while flipping through an issue of Guitar World. I had originally lauged it off until I saw the the line in the article which indicated they were looking for original ideas - which I personally translated into "form over function" or in other words, graphic quality over functioning guitar. Now this is especially good since I do not know crap about guitars 8^). Luckily for me I have access to Rocket who filled in the missing technical pieces (as in such things as where the nut and pickups are) - Thanks again for the assist!. So the first course of action was to determine the guitar theme. What to do, What to do...... and then it hit me... as in I looked at each of the walls in my den and noticed the answer staring back at me with piercing eyes. From that point on, everything pretty much clicked into place. I knew I wanted a wolf theme and I had not seen anything like at any of the concerts I had been to or anywhere else for that matter. Cool, the hard part was over, the rest is simply a labor of fun. I scoured my wolf collection and came up with the wolf image I wanted to use. Unfortunately, the image wasn't titled or gave any indication of the owner so my apologies for not giving proper credit on that end. The next step was to do a little research on guitar shapes. Fender was sponsoring the contest, so I decided to hedge my bets and draw from the artistic quality of their products. Rocket had provided all the needed terminology and explainations of the various parts of the guitar, so I could at least fake my way through the technical issues. 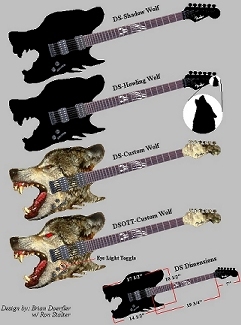 Assuming the shape plays a role in the functional quality of the guitar sound, I decided to try and map an existing guitar base on the wolf image I wanted to use. This required some creative exercises, but eventually I got the wolf's mane to line up with the base stock around the fretboard. The wolf muzzle definitely strayed from the smooth rounded base on the actual Fender guitars, but I had done some further research into another manufacturer's model called the "Flying V" which essentially consisted of a cut out V at the end of the guitar base. This actually matched pretty well with the "V" formed by the wolf jaws. The other little feature that matched up well was the indentation from the head down to the muzzle. This gap left a perfect access area for the strumming hand. All in all I probably spent the most time with the base due to the clean up work on the image and the tweaking I had to due to various places along the base edge. The next step was the fretboard itself. While Rocket was reviewing some of my early attempts, he came up with an excellent idea to add some claw type enhancements to the fretboard. I had noticed that a number of guitars had pearl inlay work on the fretboard, but figured it had to be somewhat basic in geometry in order for that to be done (yes, I started thinking about manufacturability which in hindsight may have cost me, but this is one of the factors I patted myself on the back after everything was finished). I spent a number of days trying to figure out the best way to handle the claw marks. I drew different patterns out, looked at tons of pictures on the net and went through a number of wolf reference books I had. Eventually I settled on the inlay that was most basic in shape - essentially it consisted of tapered rectangles in a curved arc. This solved two features I wanted - one was the basic shape and the other was the realization of Rocket's idea of expanding marks which gave the illusion of a claw swiping and ripping at the fretboard. Having completed the fretboard, the remaining step focused on the headstock. I knew I wanted to maintain the classic Fender shape since that feature provides distinction between the various guitar manufacturers. Again, since Fender was involved, I figured I would hedge my bets. This small feature ended up being a pivotal point in my entry since I actually had a number of ideas on what I could do with this portion. Rather than make the painful decision on which single idea to use, I decided to go with multiple versions of the guitar. This allowed for the two main ideas in the final entry - One being the pearl howling wolf silhouette in the moon and the wolf tail concept consisting of airbrushed wolf fur. I thought long and hard about having a real wolf tail, but my various attempts at doing that put a whimsical feel to the overall design which was not what I was going for. As I was putting the finishing touches on the three guitar models I had (as in the first three above) it occurred to Rocket and I that it would be coold to have some additional flash. If you are a long time Den visitor, you may remember that the entire site used to be based on images of wolf packs that utilized image maps to navigate to each of the various sections. Essentially, as your moused moved over a particular wolf in the section, that wolf's eyes would glow red. Leveraging that idea, the last guitar model was created which consisted of a red light in the eye which would flicker based on the sound being generated by the strings. That's about it, hope you enjoy - Rock On!